Based on five unique data points, the ranking is for business owners looking for a shortlist of the best business management solutions based in the cloud. The data points include user reviews, security, media presence, mobile app availability, and software integrations. Each data point is scored out of 20 for a total potential score out of 100. 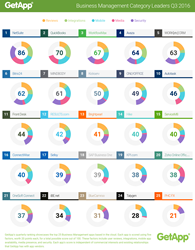 “NetSuite took a strong lead once again with a perfect 20 for security and media presence adding to its total score of 86, while second place QuickBooks followed with a 20 for integrations and mobile to add to its total of 70 points. WorkflowMax and Avaza followed closely behind with 67 and 64 points respectively, while WORK[etc] CRM’s perfect 20 for reviews helped it place fifth with 63 points,” says Suzie Blaszkiewicz, project manager of GetApp’s Category Leader rankings. See the entire Q3 2016 ranking of the top 25 Business Management solutions here. More about GetApp: GetApp, a Gartner company, is the leading premium business app discovery platform on the web. Headquartered in Barcelona (Spain), GetApp serves as a platform for user-generated and editorial reviews of software and apps for businesses.